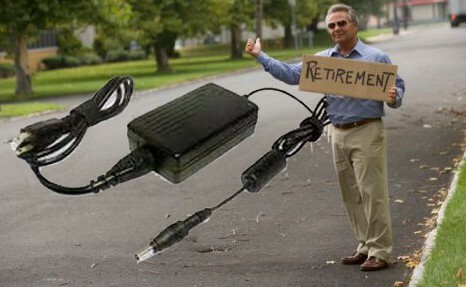 What Is the Retirement Age of Your Laptop Charger? Generally speaking, retirement is available to us when we get to a certain age. It is impossible for us to work until we are dead. So is the laptop charger. Even though many users choose to buy a new replacement after the former charger is out of order, the retirement age has already come to us before. Then how to figure out the age? Why should we learn this retirement age of laptop charger? Normally, ac adapter has reduction in internal performance and capacity with more internal resistances produced. My HP adapter didn’t work so well as before when it had been used for a period. Although it couldn’t provide enough power energy to laptop while it cannot run so smoothly as before, I just didn’t realize that it had reached the retirement age. If possible, my laptop wouldn’t be out of work so early. How can we figure out the retirement age of laptop charger? As to a new laptop charger, manufacturers always provide a one year warranty to users. For this reason, one year seems to be a demarcation line for AC adapter and laptop power cord. However, every charger has its own features and history that determine its shelf life. And we can calculate the charge time and standby time of laptop battery to check if it is close to the retirement age. What should we do if laptop charger gets to the retirement age? As to the problem, many users will choose to buy a replacement as long as the age is obvious to me, just like my HP adapter. It is really the best way to prevent any other components from damage by a new charger. Now, please have a close look at your laptop charger and check if it is close to the retirement age.